A police officer standing guard outside Memorial Park Cemetery in Christchurch while a burial of one of the victims took place today. BIKER GANGS IN New Zealand have vowed to stand guard outside mosques at the first Friday prayer service since the terror attack at two mosques in Christchurch last week. Chapters of gangs such as the Mongrel Mob, King Cobra and the Black Power have said they will protect Muslims at various locations tomorrow. Waikato Muslim Association president Dr Asad Mohsin said the group had been contacted by local Mongrel Mob president Sonny Fatu offering his organisation’s protection at Hamilton’s Jamia Masjid Mosque during Friday prayers, the NZ Herald reports. Mohsin said members of the Mongrel Mob were visiting the mosque during the week and said they wanted to come on Friday to “show their support and solidarity”. He added that the offer was appreciated during a time of such grief. “We will support and assist our Muslim brothers and sisters for however long they need us,” Fatu told New Zealand website Stuff. “The question was posed whether we could be a part of the safety net for them to allow them to pray in peace without fear. Of course we would do that, there was no question about that and we will be dressed appropriately,” Fatu said. Gangs across New Zealand and Australia have stood guard outside mosques in recent days and plan to do so again tomorrow. Fifty people were killed and dozens more injured in the mass shooting at two mosques in Christchurch last Friday. Victims’ funerals have now begun. 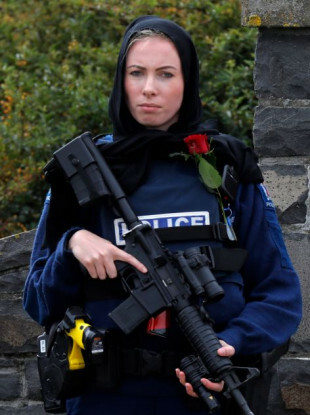 New Zealand Prime Minister Jacinda Ardern today said assault rifles and semi-automatic weapons has been banned in the country with immediate effect. Email “Biker gangs to stand guard outside mosques during first Friday prayer service since terror attack ”. Feedback on “Biker gangs to stand guard outside mosques during first Friday prayer service since terror attack ”.